As I was looking at my list of blog entry ideas for tonight’s post, I noticed something I added on Saturday that makes no sense to me a mere 2 days later. The idea on the list was simply, “Broken Early,” capitalized as such. Normally I can decipher these notes, but I have no idea what I was talking about. And it’s not an autocorrect–I typed that on my computer. Was I referring to a broken ear? A Brooklyn yearly? The original title of this post was, “Would you attend a stranger’s bachelor party?”, but now that makes no sense, so I’ll wait until tomorrow for that one. The Broken Earth trilogy is written by N. K. Jemisin, and wonderfully enough, despite being fairly new, is 100% complete and published! I had heard great things about the first book, The Fifth Season, and the reviews on Amazon confirmed it (1,235 reviews, over 4.5-star average). I love fantasy novels of all types, but I’m particularly drawn to modern fantasy in which the author creates their own world instead of putting their own twist on Tolkien. That’s very much the case here, as The Fifth Season takes place in a world where monumental tectonic shifts essentially result in the end of the world (or close to it) every few thousand years. The entire infrastructure of the world is designed around that premise. In addition, there are some people in the world who are not only in tune with the tectonic plates, but they can exert some control over them and draw energy from sources of heat (like magma). It’s a fascinating magic system. Also, the characters are fascinating and nuanced, and there’s a big overarching mystery that I’m just beginning to understand now that I’m reading the second book. I’m loving the series. 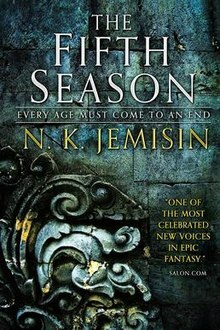 If you enjoy fantasy novels with unique worldbuilding and captivating characters, I highly recommend the Broken Earth trilogy, starting with The Fifth Season. If you’ve read the series, what do you think? No spoilers, please. If not, what’s the best fantasy novel you’ve read recently that features a wholly unique world? This entry was posted on Monday, February 4th, 2019 at 10:27 pm	and is filed under books. You can follow any responses to this entry through the RSS 2.0 feed. Thank you for the recommendation – I have read the good reviews but was afraid that this is somehow too dark, to broken for me to enjoy at the moment. I did read The Inheritance Trilogy by the same author though and that was great, so I’d recommend it. And, once more I will recommend Max Gladstone for people who want to explore a world that is very different. Thanks Sandra! I do have a sample on my Kindle for Gladstone after I finish Broken Earth. 🙂 I’ve read the Inheritance Trilogy as well and really liked it, though I think the author has gotten even better since then. I finished up this series late last year and was similarly impressed. Other books that I’ve particularly enjoyed in the Fantasy genre are S.A Chakraborty’s City of Brass, Johnathan Howard’s Johannes Cabal the Necromancer series (less high fantasy and more historical fantasy), and Jeff Wheeler’s Kingfountain series (definite historical grounding). For lighter fare, I would recommend Patrick Weekes’ Rogues of the Republic series. Imagine the TV show Leverage in a fantasy setting. Thanks for the recommendations, Anne! I’ll check these out. I like Johannes Cabal, too, so I noted these recommendations to check out soon. Thank you! Fantastic – lucky enough to have this as a course book in my elective literature subject this trimester. Makes a refreshing contrast to the criminology! Becky Chambers took it home for me in 2018. Tomi Adeyemi’s Children of Blood and Bone was a very pleasant discovery too. Does anyone have recommendations for someone who likes crossing the bridge between contemporary literature, spec fic, and fantasy and sci fi? I know I’m being a bit greedy! I absolutely love Becky Chambers’ books–another one is coming in a few months! That’s an interesting question. I think Red Rising pulls a little from each of those categories. Thanks for the recommendation Jamey, will have to get stuck into then soon!